In simple terms, a “dirty bomb” is a conventional bomb (dynamite, C4) combined with radioactive components (powder, pellets) so that the explosion creates a cloud of radioactive material. That makes a dirty bomb in technical terms a radiological dispersion device, or RDD. It’s sometimes classified as a weapon of mass destruction, but as you’ll see, this is debatable, if not misleading. Among the many kinds of potential catastrophes, a “Dirty Bomb” makes a very good case for the importance to a survivalist of getting accurate information and making an appropriate response. Like many major catastrophes if you’re at or near ground zero during a dirty bomb event, severe injuries and death are possible. However, unless there is a coordinated terrorist attack, a single dirty bomb in one target (usually a city), has effects ‘limited’ to the immediate blast area and the dispersal cloud of radioactive material. In short, this is a ‘local’ event. If you’re not located near the target and are not potentially downwind, then the attack is not an immediate threat for you. Over the past decades of nuclear technology, there’s been plenty of talk about dirty bombs. It’s an easily understood and gruesome concept, blowing up a chunk of territory and releasing a cloud of deadly radiation on a population. It sounds bad and like it’s tailor made for terrorism. The thing is there has never been a dirty bomb attack. The only known instance is a deliberate test by the government of Iraq (under Saddam Hussein, of course) in 1987. They found that the levels of radiation produced were not high enough to be lethal, nor was the dispersion of the weak radioactivity signi ficant. Dirty bombs are not technically difficult to make. 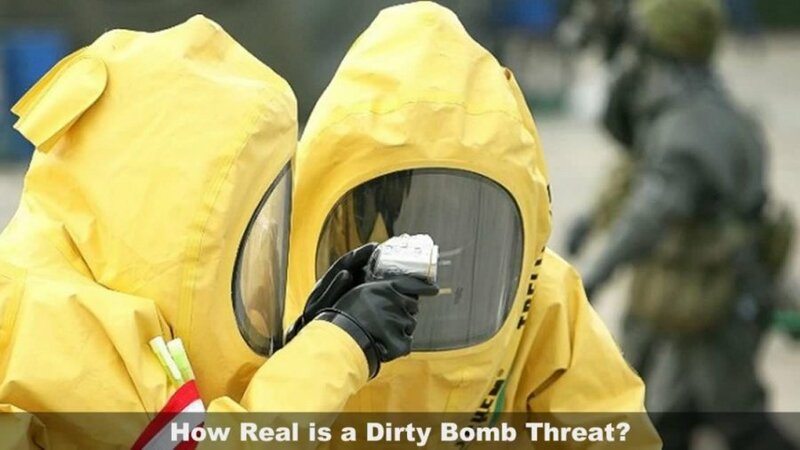 It’s vital to understand that a dirty bomb is nothing like a nuclear bomb. Although it involves radioactive material, there is no atom splitting. In fact, if a nuclear bomb fails to ‘go nuclear’, it winds up being a dirty bomb – just a conventional explosion that blows a lot of nuclear material into the air. The hard part of a dirty bomb (from the terrorist’s point of view) is not making the bomb. It’s very similar to making a regular bomb. The problem is acquiring enough radioactive material, especially the material of the ‘right’ kind, that is, relatively high-grade material with more active and damaging radiation. There are fewer than ten radiation sources considered suitable for radiological terror, including caesium-252, cobalt-60, plutonium-238 and radium-226. High-grade forms of these isotopes are produced in nuclear reactors and stored with considerable security measures. They are not readily available, legally or otherwise. Low-grade forms of these radioactive isotopes, like those found in hospitals, are available but it would require very large quantities. There is also the fact that the more potent the radioactive material, the more difficult it is to handle – for the terrorists as well. How Bad is a Dirty Bomb Event? The main reason a dirty bomb is not generally considered a weapon of mass destruction, nor is it popular among terrorist groups, is that it’s not very effective. Depending on the type of conventional bomb material used, the amount and type of radioactive material, and the location of the detonation – the most dangerous part of a dirty bomb is the conventional bomb explosion. This all means that the primary value of a dirty bomb is not the real damage it may cause but the psychological effect. The ability of a terrorist (group or individual) to detonate a dirty bomb in a major city and the resulting blast damage, public chaos, and the prolonged effects of radiation cleanup could have an impact on the political and economic system. If you were in or near the blast zone (and survive the blast), the main problem with surviving a dirty bomb is acquiring the knowledge it was a dirty bomb. Radioactive material produced by a massive conventional bomb blast doesn’t look any different from any other material in the blast. There is always dust and debris, which no matter what the cause should be avoided. However, until emergency response units arrive and do their initial analysis of the scene (which these days usually does include inspection with radiation detection equipment), it’s unlikely anybody will know that a dirty bomb was involved. Even after determination that radioactive materials were involved it may take some time before the information becomes publicly available – and that assumes you have access to radio, television or some other means of getting the information. The simplest advice is, if a blast occurs and your location isn’t directly affected, shelter in place or if you are outside, find a building to shelter in. Attempt to find a source of public information by phone, radio or computer, assuming any of these things are working. If you were outside the blast zone, survival is most likely not an issue. However, knowing there was a dirty bomb explosion is still a primary concern. The dispersal of radioactive material will follow prevailing winds and topography and as quickly as possible emergency authorities will try to analyze and predict where it will go. You need to get that information, either to avoid the wind-driven material (kind of a get out of Dodge exercise), or to find means of avoiding the material – usually indoors and with some kind of air filtration. In any emergency situation where dust is involved, filter masks are always a good idea. In fact, you should always carry some in your emergency kit or bug out bag. Some people are aware that potassium iodide (KI) is sometimes used to protect the thyroid gland from radiation, but it is not recommended because 1. It’s only beneficial if radioactive iodide is present, 2. You take it before exposure, and 3. You don’t have a bad reaction to it. In the event of a dirty bomb incident, there are likely to be two important reactions. One is a matter of cleanup. In addition to the destruction caused by the conventional bomb explosion, everything in the affected area – and touched by radioactive dust – needs to be decontaminated. This is a painstaking and complicated process which often precludes, at least temporarily, the use of equipment that makes more dust or debris. In short, cleanup from a dirty bomb is likely to take a lot of time, and cause a lot of economic disruption. The other reaction is to the political and social situation. While it’s unlikely that a single dirty bomb incident will have significant impact on a country’s economy, it might be very significant politically. Depending on the type of terrorism involved and the source of the attack, a dirty bomb – by its relative uniqueness and pathological ugliness – could provoke social, especially ethnic, reactions. Most experts in and out of government believe a dirty bomb attack is possible; however, it’s just one item in a list of acts that terrorists could perpetrate – and probably not the most likely. As a survivalist, this means preparation for a dirty bomb depends very much on where you live or work (in a major city or not), on your ability to react to an explosion in your area (whether dirty bomb or not), and your ability to assess the resulting economic, political and social situation that results. A dirty bomb is a possibility, but it is easy to overreact to either the possibility or the actual event.